What’s the first thing that comes to your mind when you hear the word nuclear? Personally, I think of the atomic bombs that were dropped on Japan in 1945, but did you know that the same process that was used in the bomb is the same process that’s used to power the Sun and other stars in our galaxy? There are two different proceses that can occur in a nuclear reaction, fission and fusion. Referring to figure one, whether or not if an element goes through fission or fusion depends on the binding energy per nucleon (the amount of energy required to break an atom apart) and the mass number (the amount of protons and neutrons in the nucleus). Figure one (above) shows the relationship between binding energy per nucleon (the amount of energy required to break apart an atom), and the mass number of an element (which is the number of protons plus neutrons in an atom) . Elements with a high binding energy (such as iron) are harder to break up. 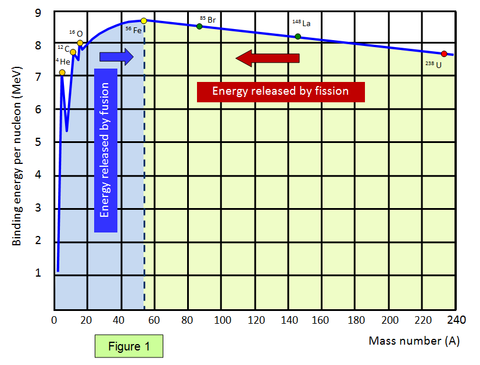 Any element that weighs less than iron produces energy through fusion (blue region), whereas everything else would undergo fission to create energy. In a fission reaction, the atom (an object with protons and neutrons in the nucleus that is surrounded by electrons) is bombarded with a neutron and divides it into smaller pieces. Once a fission reaction begins, it sets a off a series of reactions that set off other reactions. When an atom is hit with an neutron, it breaks off into smaller parts, and the neutrons that are released collide with other atoms and start another reaction. The more chain reactions that are set off the more energy the atom releases. Fusion is when two small atoms crash into one another to form a larger and heavier atom. The fusion process can only be done in environments with extreme heat. On Earth, tritium and deuterium, isotopes (atoms with the same number of protons but a different number of neutrons) of Hydrogen, are used as fuel for bombs. However, Earth has a small supply of tritium, and it has a short half life (which is when the concentration of an element decreases by half). In order to compensate for this, scientists produce their own tritium by hitting deutrium with a neutron. Fusion is also the same process that fuels the Sun with energy. The heat that is radiated from the Sun is created in the core through the proton-proton chain reaction. During this reaction, various hydrogen atoms go through nuclear fusion and are converted into helium atoms. Some of the energy that is released from the reaction leaves the Sun and travels through space as light, and the remaining energy stays in the core and continues the fusion process. If a star has a higher core temperature, it will use nitrogen or carbon in the transition from hydrogen to helium. Although fission reactions are common on Earth, it is the fusion reactions that are responsible for providing stars with fuel. However, depending on the size and temperature of the star, the specific process could vary.